Wayne Champeon was a 5’7” wiz on the hardwood. 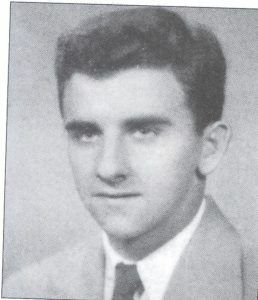 The Greenville native led Greenville to the state championship in 1954. Wayne played at the University of Maine on what many consider its greatest teams with Skip Chappelle, Don Sturgeon, and Laddy Demer. Wayne was the spark plug point guard whose quickness and guile with the ball drove opponents crazy. After his playing days were over, Wayne coached at Edward Little and Foxcroft Academy. Wayne has also been inducted to the University of Maine and Maine State Sports halls of fame.